Pop-rock with a twist, Marah delivers plenty of jam-rock and folk-ish moments while producing one of the catchiest, most hook-laden performances of the year. Kids In Philly has the wisdom and depth of the best folk albums, grooves that exceed any jam record out there, and a country-tingled sense to round everything out. Whiskey-stained vocals burn through the songs; the rhythm section calmly stumbles through, providing blazing moments of fury and relaxation; and the guitars ignite the music and propel it towards its ultimate goal of getting you moving track after track. 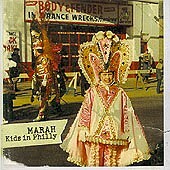 Suffice to say, if Marah doesn't get you moving with some dance-able, highly flammable folk-rock, than you might as well just give up, because it just ain't in ya. If you're looking for passion, fun, and plenty of grooves - not to mention excitement - to feed off of, than Marah is your folk-rock savior. Tight, punchy, and plenty powerful, this band will roll over you without blinking, and you'll be left in the dust wondering what just hit you. I'll give it an A.